To capture and share the best memories of your life with family and friends, You can use the Triple Rotating main and selfie camera of this Samsung phone (48MP + 8MP + 3D Depth Camera), with Flash and Auto Focus features. The Galaxy A80 SM-A805F has 3700mAh battery with Super Fast Charging support. It has built-in Fingerprint (Under Display), Accelerometer, Gyro, Proximity, And Compass sensors. 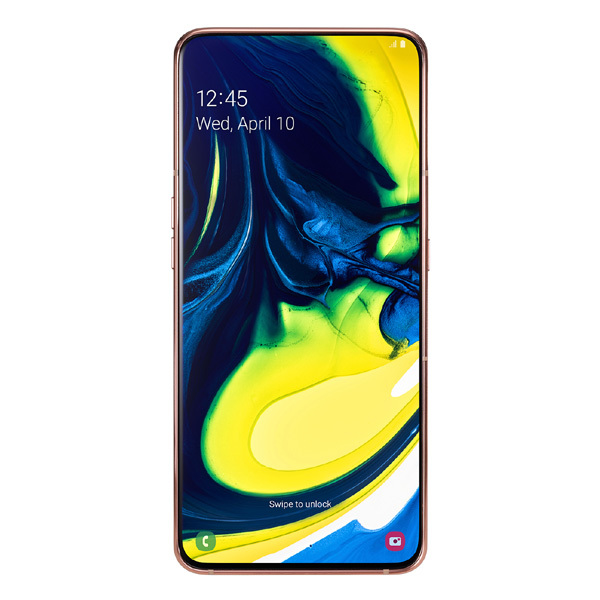 The Full Specifications and Features of the Galaxy A80 SM-A805F are listed below. You can read them to know more about its supported networks, dimensions, and weight. The Galaxy A80 SM-A805F colors, SIM card size, And the installed version of the Android operating system. - Motorized Pop-Up Rotating Main Camera.